The panel imposed a 12-month transfer embargo on the club and banned Craig Whyte from future involvement in Scottish football. 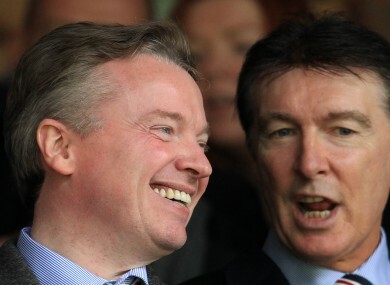 All smiles: Whyte (L) with Gordon Smith, the club's director of football. GLASGOW RANGERS’ FINANCIAL immolation gathered apace last night with the presentation to the Scottish Football Association (SFA) of a report condemning the club’s financial management. Undertaken by an independent judicial panel, the report detailed the manner in which the club circumvented a number of a key statutes and directives en route to undergoing an “insolvency event”. Taking an uncompromising stance, the SFA issued the embattled club with a 12-month transfer embargo and imposed over £200,000 in fines and automatic penalties. Appearing to accept the argument of administrators that owner Craig Whyte bore ultimate responsibility for the club’s financial implosion, the SFA issued the Motherwell businessman with a lifetime ban from Scottish football. “The thrust of the charges against the club focused on non-payment of payroll taxes and evidence was produced that all such decisions in this area were taken by Craig Whyte during his tenure. A recent report by the same paper suggests Rangers will struggle to remain solvent beyond the middle of next month. Further complicating matters is the nature of the current wage reduction agreement with players, contingent on the restoration of full pay by June 1. Video: How about this for a long-range screamer? Email “Scottish FA tribunal leaves Whyte and Rangers fuming”. Feedback on “Scottish FA tribunal leaves Whyte and Rangers fuming”.